Do not fail to initialize the tire pressure warning system after tire rotation. 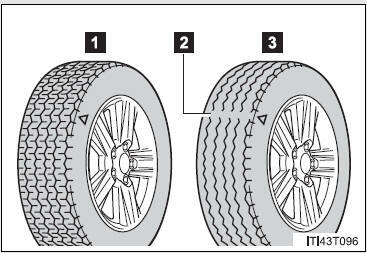 When rotating the tires on vehicles differing with front and rear tire inflation pressures. When changing the tire inflation pressure by changing traveling speed or load weight, etc. Park the vehicle in safe place and turn the “ENGINE START STOP” switch to OFF. Press and hold the tire pressure warning reset switch until the tire pressure warning light blinks slowly 3 times and the message “TIRE PRESSURE RESET PROCEEDING” appears on the multi-information display. Wait for a few minutes with the IGNITION ON mode, and then turn the “ENGINE START STOP” switch to OFF. When operating the tire pressure warning reset switch, the tire pressure warning light does not blink 3 times and the setting message does not appear on the multi-information display. The tire pressure warning system may not provide warning immediately if a tire bursts or if sudden air leakage occurs. Do not mix tires of different makes, models or tread patterns. Do not use tire sizes other than those recommended by Toyota. Do not mix differently constructed tires (radial, bias-belted or bias-ply tires). Do not mix summer, all season and snow tires. Do not use tire that have been used on another vehicle. 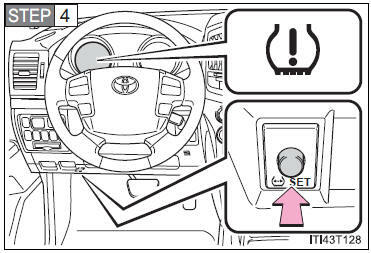 When removing or fitting the wheels, tires or the tire pressure warning valve and transmitter, contact your Toyota dealer as the tire pressure warning valve and transmitter may be damaged if not handled correctly. When replacing tire valve caps, do not use tire valve caps other than those specified. The cap may become stuck.